KOHLER One Piece Toilets Overview And Recommendation - Toilet Found! You probably know of the advantages a one-piece toilet has over the two piece model. And chances are, you love the looks, and it’s super easy to clean and maintain. Most of all, you don’t have to worry about water leaking out of the tank to mess up your bathroom floor. Good decision you have. 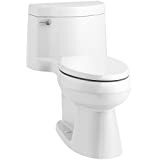 Even better, you are looking for a KOHLER one piece toilet. Excellent judgment there because KOHLER has some of the best-looking water closets with impressive features and affordable pricing. But which model are you looking for specifically? That’s why you are here. And you’ve come to the right place as this article is going to walk you through all the best one-piece toilets which KOHLER is currently producing. Before you can narrow down to the model you desire, you need to know the four different types of KOHLER one piece toilets. And each type comes with different designs to match your bathroom interior. The good thing is, almost the entire range of KOHLER one piece toilets have similar features. The only difference is the exterior looks, which is to provide a variety of design to match whatever bathroom style you’ve got. So it isn’t that overwhelming as it seems actually. And in no time you will know every KOHLER one piece toilets at your fingertips. Now, bet you are getting the idea. And have you already know what build and design you want? No hurry. Let’s get you through to the design specifics and understand how KOHLER create and design their one piece toilets. Along the way, you will understand more of the features and costs of each toilet types. KOHLER has a very creative way to name their toilets. If you want a contemporary or modern design, there’s no lack of it in KOHLER’s range of one piece toilets. Regardless of the type, you have the widest range there. A few popular contemporary design toilets are the Cimarron, Santa Rosa, and Adair. Especially Cimarron, you can have it with exposed-trapway or skirted with visible mounting bolts. The Santa Rosa and Adair models are only available in exposed trapway design. If cost is your primary consideration, the Santa Rosa should be a good fit. In fact, it is also the best selling KOHLER toilet in Amazon. Then there are the traditional designs which go well with Victorian or country style bathrooms. The best selling one is the Memoirs Stately which is available with exposed trapway and fully skirted design. Last but not least, the tankless toilet is a different class altogether. KOHLER only has three tankless models, and they are Numi, Veil, and Karing. They can cost anywhere between $3000 to $5000 a piece, not including installation. These intelligent toilets from KOHLER are great eye pleasers in any modern bathrooms. KOHLER has 30 models of its one-piece toilet, including the tankless models. But let’s leave the three tankless toilets for another day. With 27 to choose from, it can still overwhelm you if you don’t know where to start. So before you get all mixed up with the features and specification, let’s do a systematic approach and make things easier for you to digest and follow. First, you need to familiarize yourself with some of KOHLER’s unique features in its range of one piece toilets. Then you can be clear with your choice of toilets that match both your budget and bathroom design. Before you get down to choosing the right KOHLER one piece toilet, it’s good to know the feature and performance of each toilet. There are features that are unique to KOHLER, and important enough that people usually overlook. One of it is the water surface area. KOHLER has the largest water surface compared to its closest rival. A large water surface in the bowl can help with odor issue better and reduces skid marks. It keeps the bowl clean and prevents sewer gases from seeping through. So do keep an eye on the water surface area size. It should preferably be at least 9″ x 8″, which “coincidentally” is American Standard’s standard water surface area. And please note that not all KOHLER one piece toilets have large water surface. Another feature is, of course, the AquaPiston canister flush valve. Besides being powerful and efficient in flushing, it’s reliability is unprecedented. With 90% less exposed seal material, it is more durable than the typical flapper valve. And its leak-proof design frees you from all worries of high water bills for water you didn’t use. The flushing power of the AquaPiston ensures a clean flush every time. Clogs are few and far between which most users have not experienced any for years. So just these two features alone are worth your investment for a peace of mind. Of course, there are also other flushing systems available in KOHLER one piece toilets, like Dual Flush and Pressure Lite. They may not be as efficient as the AquaPiston, but will still do the job well. Always go for the elongated bowl for sitting comfort if you will. The round front bowl will save you a few inches in front space if you have a small toilet. The comfort height is a personal preference. Some people loves the ease of sitting down and getting up from the seat with the comfort height. While some just prefer the regular height. But do spare a thought for the elderly in the house, the comfort height will serve them well. And you can always use a step stool if you find the comfort height to be a little stretch for your legs. And finally, the touchless flush will move the level of hygiene in your bathroom up several notches. It’s also a great help for those with some motor disabilities. 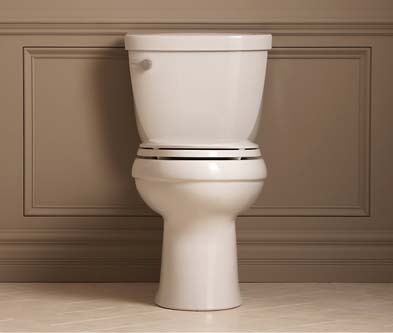 The AquaPiston flush and a large water surface area are two must-have features for any KOHLER one piece toilets. Don’t compromise on this two if you want to be free from plugs. The only two Dual Flush models are Reve and Saile. Both have a water surface area of 4-1/8″ x 5-1/2″ and 4-1/8″ x 5-1/8″ respectively. Unless you are a lady living alone, otherwise choose an elongated bowl. The man (or men) in the house will appreciate better than the round front bowl, for a reason only the guys will know. Besides, it is easy to get replacement seats. The comfort height may seem like an option but choose it regardless. Yes, some people just don’t like a high sitting toilet. But you never know, there will be a time when your knees are going soft (a.k.a. aging). Or (touch wood) a leg injury, then you will know it’s the right decision. A step stool is always a great idea if you are a little short physically. Abide by these recommendations, and you are on your way to seize the best KOHLER one piece toilets in any design. Now, let’s move on to the individual type to help you with choosing the right KOHLER one piece toilet. 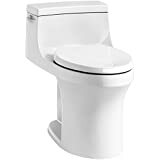 The base models of all one-piece toilets are those with exposed trapway. And they are the least expensive compared to the skirted models. If you own a regular two piece toilet, you know what it’s like with exposed trapway. It’s the most common toilet type in every home. About 80% of toilets sold in the USA are two-piece toilets with exposed trapway. The thing about exposed trapway frankly, it looks ugly. And quite a chore to clean with all the bulges and crevices of the trapway. But because it has a long history, people are used to it and accept it as it is. However, with the tank fuses with the bowl as one piece, it changes to a more streamlined look. But regardless whether the trapway is visible or otherwise, performance wise is the same. It’s just a matter of preference and cost. More than one-third of KOHLER one piece toilets are exposed trapway. And almost all of them uses 1.28 GPF with the AquaPiston flush technology. Except for San Raphael K-3597-0 which uses only 1.0 GPF. The only 1.6 GPF model is the Santa Rosa K-3811 which also has a 1.28 GPF version, the Santa Rosa K-3810. 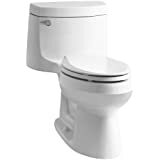 Both versions come with comfort height and elongated bowl and the powerful AquaPiston flushing system. Both 1.6 GPF and 1.28 GPF of the Santa Rosa toilet has a MaP 1000 rating; this is proof of the AquaPiston flushing power. It means the toilet is capable of clearing 1000 grams of solid waste in a single flush. This rating is the highest given by MaP after a vigorous lab test. The majority of KOHLER’s contemporary and traditional design toilets are rated MaP 1000. The most obvious “advantage” of the one piece toilet with exposed trapway is the affordable pricing. That is when you can accept White, which is a universal color for a toilet. The price is not too far off from the cheaper two-piece models usually. Otherwise be prepared to fork out another $100 to $200 for other colors. 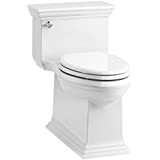 So if you are all set with this one-piece and exposed trapway KOHLER toilet, here are the best models you may want to consider. These 3 KOHLER models have the highest user ratings about their flushing efficiency and aesthetic. 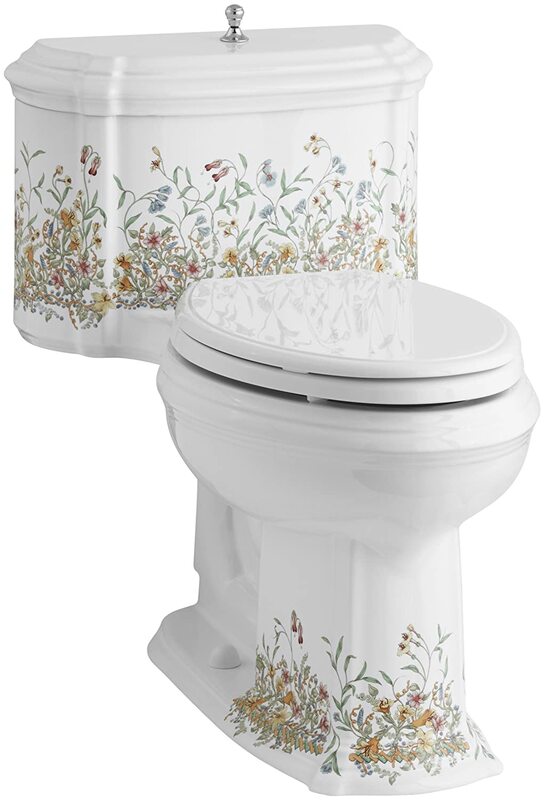 The KOHLER Memoirs Stately toilet will be a good match for a Victorian or Country style bathroom. Otherwise, the Santa Rosa model or Cimarron is good with most contemporary design bathrooms. And if you prefer a low profile tank model, the San Souci K-4007-0 should complement your modern bathroom well. But this San Souci model only comes in round front bowl and normal sitting height. 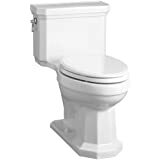 So if you prefer a modern one piece toilet with comfort height and elongated bowl, there are several models with a skirted design. Including San Souci. The only odd one out in this category is the San Raphael. Before you are attracted to its luxurious look, there are some drawbacks you need to know. 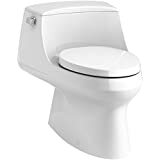 This toilet uses only 1.0 gallon of water and flushes with the Sloan FLushmate which is a pressure-assist flushing system. While the flushing power is great, it can be rather annoying with the loud flushing noise it makes. That’s typical of all pressure-assist flushing. Besides, replacement parts are usually not readily available and more expensive. If you find the exposed trapway to be an eyesore, consider going for a skirted design. Besides being better looking, cleaning is a breeze with all the flat surfaces. But what is it about the visible mounting holes? If you have ever tried to install a concealed trapway toilet before, you know how challenging it can be. The aligning of the T-bolts on the flange to the bowl can be a nightmare. To get it right often requires careful plotting of the bolt position. And even with the templates that come with it, you can still make mistakes. All because you can’t see where the bolts are. Experience plays an important part here. So KOHLER has you covered. Instead of having it fully concealed down to the mounting bolts, it covers only the trapway. Exposing the mounting holes for the T-bolts. You can now install a skirted toilet just like any exposed trapway models. No guessing work at all. And don’t forget to cover the ugly bolts with cap covers which come along with your toilet. The Cimarron needs no introduction here. But for the traditional models, you’ve got Kathryn and Portrait. So between Kathryn and Portrait, what are the differences? The main difference, apart from their exterior looks, the trip lever of the Portrait is a lift-knob located in the center of the lid cover. So you don’t have a problem with left or right lever to consider. It’s just a matter of personal preference, and both models should give you the same performance level. And San Souci is the only modern design toilet with 3 variations. You can choose between the standard trip lever and touchless flushing. Or, touchless with Purefresh, which is a soft-close seat with built-in odor filter and night light. If improving hygiene is your top priority, the touchless model will be your obvious choice. 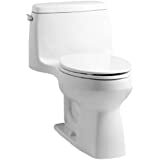 All models in this category are 1.28 GPF, comfort height with elongated bowl and large water surfaces. Every model here uses the AquaPiston flushing system. This range of KOHLER one piece toilets is a good in-between the ugly and the classy. It will cost about another $200 more than the exposed trapway type. If you prefer this design better than the exposed trapway models, here are the best models for you. The Cimarron here has the largest water surface among all the KOHLER one piece toilets. In fact, it could be the largest in the industry. And with the powerful AquaPiston flush which scores a perfect MaP 1000, no more worries of clogs. If you can push your budget a little more, get this Cimarron over the exposed trapway model. You will also love how easy it is to clean. The Kathryn has a slightly wider bowl than the Portrait. As a result, it has a wider water surface which provides for an easier spot to aim. The little edge it has over the Portrait is its trip lever is on the side of the tank. Leaving the flat top of the tank lid with space for putting some decorative items, or a basket for toilet rolls. Unless you want a nostalgic feel, then the Portrait is a better choice for a sense of old fashion-ish design. If you love the San Souci look and prefer the elongated bowl and comfort height, this is it. As the exposed trapway model can only provide a round front bowl with a regular sitting height. And the good news is, the cost difference is rather small. For another $50 to $100, you might even be looking at the touchless model as well. And since all the 4 San Souci models here are similar in features, the performance level is the same. The water surface area of San Souci is the same as the Portrait. These are the high-end models of the KOHLER one piece toilets. Whether in appearance or ease of upkeeping, this range of KOHLER toilets is a favorite among home designers and architects. If you have a generous budget, go for it. You will love how these beautiful toilets blend in with your prize bathroom. You have a choice of traditional or modern style to match whatever bathroom design you may have. You will also save a ton of precious time in keeping the toilet clean. There are no bulging surfaces, kinks, and even bolt covers to clean. A few wipes down the flat skirting and the joint-less tank is all the cleaning you need for the day. If you spot a Victorian or country style bathroom, the traditional models need no introduction at all. Whether it’s a Memoirs Stately, or Classic or the Tresham, they are build to complement the bathroom interior. And all of them have the same features, which include the powerful AquaPiston flush. And if you prefer a modern twist, there are the squarish Reve or the sleek, curvy Saile to command how your bathroom looks. Or the San Raphael with a low tank profile is sure to draw compliments from your house guests. The Reve and Saile are the only two models with the dual flushing system. The rest (not including the tankless) are using the AquaPiston flush technology. Installation wise, do consider to get professional help. As mentioned, fully skirted toilets are not an easy install. Especially when you have not done any toilet installation before. The last thing you ever want is an improper installation which will lead to endless nightmares and frustrations later. Since you already paid so much for a toilet, never pinch on getting a proper installation. There are only the traditional and modern designs in this category, which include the tankless models. The Memoirs Stately is still the favorite here. The stark difference among the three traditional models is their tank design. Again, it’s entirely up to your preference. But the Tresham has a more elaborated trip lever design. It’s two piece model has some decent reviews on Amazon, mostly about its look. Performance wise is good with the AquaPiston flushing system and large water surface area. However, it’s the smallest compared to the Memoirs Stately and Memoirs Classic at 9-5/8″ x 6-7/8″. There are no contemporary design toilet models here. Perhaps KOHLER has plans to add more variety in this category later. It just doesn’t make sense not to include them as the demand for concealed trapway toilets is on the rise. And contemporary design toilets have the highest demand among all. Lastly, the modern look is nominating this fully skirted category. And that’s because KOHLER considers those tankless models as one. But let’s just focus on the gravity flush models here. So that gives you the Reve, Saile, and San Raphael. If you are for the AquaPiston flush and large water surface area (highly recommended), then the San Raphael K-3722-0 is the only choice you’ve got. Otherwise, the dual flush Reve and Saile have a unique look that never fails to liven up any modern bathroom design. Fully skirted and one piece is a dream come through for the busy homeowners. You will enjoy more time freedom with cleaning time cut down tremendously, and no more stretching to reach out to the hidden areas. If you hate to spend even two more seconds to clean toilets, here are the best time saver models to consider. The Memoirs Stately here is slightly shorter in length compare to the exposed trapway model. It’s 3/8″ (0.375mm) short to be exact. And the water surface area is smaller than the exposed trapway type. But still a large enough water spot to aim safely and filter off the foul sewer gas. In the same design group, the Memoirs Classic is identical in features and specifications as Memoirs Stately. Even down to the same water surface area. So it doesn’t make sense to recommend one and not the other when they both give the same performance level. It’s how you love the looks between the two that matter. Last but not least, the performance and features of San Raphael are great except for its regular seat height. If that’s not an issue with you, it is a much better option than the Saile. Why most of the recommended models don’t seem to have that many user reviews? If you rely on user reviews to help with your buying decision, you are likely to be disappointed. And the truth is KOHLER one piece toilets are not receiving as many reviews as its competitors. Why is that? The main suspect – Cost. Usually, when a toilet cost over $500, it won’t get reviewed as much. You can check the stats on Amazon and Home Depot. The higher the price of a toilet, the fewer reviews there are. Of course, there are always exceptions. Like the TOTO Ultramax one-piece toilet, or the G500 tankless crapper. 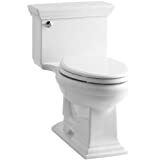 A good example of cost versus reviews is the KOHLER Memoirs Stately and Cimarron toilets. Both models are available in two-piece and one-piece design. If you look at the lower priced two-piece models, they are buzzing with reviews. But once you switch over to the one piece, it’s a different world altogether. But the fact is, both designs have similar features and specifications. The difference, besides the construction, is the cost. The one piece price is almost twice of the two-piece model (above $500). So instead of relying 100% on user reviews, have a look at the features and specifications as well. If it works well with two-piece, it should also work on the one-piece model. Add to Flipboard Magazine. Does the 1.6 GPF in the K-3811 Santa Rosa cut down on the flushing noise. We have the Gabrielle now and it has a very noisy elongated flush. We want to send the Gabrielle back. I’m sorry, I just wish I can give you a straight Yes or No answer. There are just too many possibilities to a noisy toilet, and that includes your tolerance level. The best advice I can give, and I know it is not so practical, is to try it.